Need a roof repair? Our team of expert roof repairers will go anywhere in Melbourne to provide the best quality roofing repairs. With many years of experience in the provision of roof repairs for homes and businesses around Melbourne, you can rest assured that your roof will be in safe hands with us. Obligation Free Quote and Consultation, Call Us. It doesn’t matter what kind of home or building you have, or what style of roof, we’ll be able to help. We’ve worked on tile roofs, slate roofs, metal roofs, terracotta roof tiles, concrete roof tiles and more. We can help with all kinds of roof repairs including re-bedding, re-pointing, and we can also clean roofs with build up of moss and lichen. We Provide Roof Repairs All Across Melbourne. We provide roof repair services all over Melbourne, so whatever suburb you’re in we can help. Our service area includes the city centre, northern suburbs, western suburbs, eastern suburbs, southern suburbs, and right around the bay. General roof repairs are our specialty. We’ve been in the industry for years which means we have experience delivering all kinds of repairs on all kinds of roofs. Quality of workmanship is something we take extremely seriously, as we know how important it is to have a roof that’s in perfect condition. 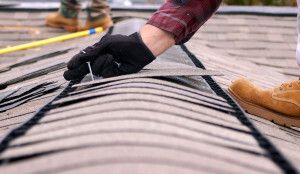 You can rely on our professional and friendly team of roof repairers to deliver every time. 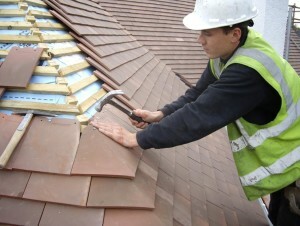 Tiles are a popular choice of material for many roofs in Melbourne. While tiles looks great, there are a number of things that can go wrong which will require repairs. Common types of repairs that can be required for tile roofs include re-bedding and re-pointing, cleaning of moss build up is another common requirement. If you have a slate roof that needs repairing we can help. While slate roofs are usually quite resilient, they can still become vulnerable in certain circumstances, such as if they’re not fitted properly originally and allow weather damage to permeate through. The nails that are used to keep the slates in place can also waste away over time, meaning the tiles can move out of place and expose the roof to water damage. Extreme storm conditions can also damage slate roofs by moving the slates out of place and exposing the roof to weather damage. Slate roof repairs are a specialty of ours and we’re able to provide obligation free quotes and consultations to fix these. Metal roofing is popular in Melbourne for it’s price, recyclability, toughness, non-combustibility and vast array of offered colours. We use just the most reliable steel for all our metal roofing jobs. Our providers are renowned for supplying the toughest materials for roofs in Australia, so you can have assurance knowing your brand-new roofing will last for many years to come. The safety powder covering makes our steel far more resilient than zinc and aluminium items, and with correct installation, need to last for decades to come. A metal roofing system replacement will normally take around 1-2 weeks, while a roofing repair will normally take about 1-2 days. Both these timeframes are dependant on the scale of the task and the weather. And don’t fret; we do all roofing replacements in a step-by-step process to guarantee that your house is waterproof at all times. All roofing and guttering is going to degrade as time passes. Rusted or inadequately installed gutters generate problems for many Melbourne home owners. A few of the recognizable signs of gutter degeneration are bubbling paint, rust and discolorations on the underside of eaves. Significant guttering faults might result in spots around windows, down walls and even on the ceilings. Such leakages are more than likely to be caused by gutter overflow. Do your gutters overflow? Gutters overflow for a number of reasons. They might be blocked with rubbish, or the slope towards the down pipes might be insufficient. We can help you with all your guttering requirements. You can likewise have peace of mind that we utilize high quality products on all roof and gutter repair projects. Even the best made and highest quality roofs will deteriorate over time, particularly if they’re exposed to harsh elements such as storms, strong winds, hail or pesky rodents. Whether your roof is just looking a bit tired or has sustained significant damage, we can help with complete roof restoration services right across Melbourne. If you’re looking for a quote on a roof restoration or just have some questions about it, give us a call and one of our friendly roofing consultants will field any questions you might have. We provide a 24/7 emergency roof repair service, as we understand that roofing issues can most often occur at highly inconvenient times. Whether you have an issue with a roof leak, sections of the roof being damaged by a storm, or damage caused by large objects such as trees falling on your roof, we can have one of our roof repairer experts out on the scene at any time. With a reputation for wild weather that changes every hour, Melbourne can be very tough on a roof. If your roof succumbs to the elements, the expense and inconvenience of leaks or wind damage can have a big impact on businesses. It may result in employees being unable to work, damage to stock or inventory, or in bad cases death or injury to staff or customers. Whatever your issue is, our commercial roof repair service will get your roof in top condition with a very fast turn around. We also offer roof checking services as a preventative measure to help ensure there aren’t any surprise issues with your roof. Call Us Today For An Obligation Free Quote And Consultation. Reservoir, Berwick, Glen Waverley, Werribee, Hoppers Crossing, St Albans, Frankston, Rowville, Sunbury, Pakenham, Craigieburn, Point Cook, Mount Waverley, Mill Park, Preston, Narre Warren, South, Noble Park, Melbourne, Doncaster East, Epping, Bentleigh East, Bundoora, Ferntree Gully, Coburg, Glen Iris, Dandenong, Endeavour Hills, Kew, Richmond, Hampton Park, Croydon, Northcote, Brunswick, Dandenong North, Tarneit, Langwarrin, Brighton, Hawthorn, South, Morang, Boronia, Mooroolbark, Greensborough, Caroline Springs, Thomastown, Balwyn North, Cheltenham, Malvern East, Camberwell, Keysborough, Lalor, Springvale, Glenroy, Roxburgh Park, South Yarra, Carrum Downs, Wheelers Hill, Essendon, Altona Meadows, Cranbourne, Doncaster, Eltham, St Kilda, Mulgrave, Frankston South, Wantirna South, Thornbury, Wyndham Vale, Mount Eliza, Sunshine West, Templestowe, Carnegie, Deer Park, Taylors Lakes, Seaford, Ringwood, Brighton East, Lilydale, Clayton, Bentleigh, Pascoe Vale, Meadow Heights, Mitcham, Elwood, Cranbourne, Caulfield North, Port Melbourne, Wantirna, Yarraville, Moonee Ponds, Carlton, Ascot Vale, Keilor East, Williamstown, Footscray, Burwood, Templestowe Lower, Brunswick West, Surrey Hills, Hawthorn East, Balwyn, Toorak, Beaumaris, Blackburn, Fawkner, St Kilda East, Hampton, Springvale, South, Newport, Greenvale, Donvale, Taylors Hill, North Melbourne, Mentone, Clayton South, Diamond Creek, Fitzroy North, Vermont South, Altona North, Doreen, Caulfield South, Bayswater, Prahran, Parkdale, Ivanhoe, Avondale Heights, Box Hill North, Nunawading, Bulleen, Sunshine North, Blackburn South, Broadmeadows, Sydenham, Keilor Downs, Highett, West Footscray, Dingley Village, Maribyrnong, Hallam, Burwood East, Forest Hill, Kilsyth, Altona, Vermont, Elsternwick, Ringwood East, Kensington, Box Hill, Ringwood North, Macleod, Arundel, Pascoe Vale South, Malvern, Fitzroy, Mount Evelyn, South Melbourne, Sandringham, Heathmont, Kurunjang, Oakleigh South, Truganina, Chirnside Park, Sunshine, Cairnlea, Armadale, Montmorency, Cranbourne West, Murrumbeena, Brunswick East, Delahey, Bayswater North, Doveton, Gladstone Park, Kings Park, Cranbourne East, Braybrook, Strathmore, Rosanna, Canterbury, Chadstone, Maidstone, Ormond, Box Hill South, Croydon North, Ashburton, Patterson Lakes, Mordialloc, Oakleigh, Flemington, Skye, Clarinda, Noble Park North, Chelsea, Knoxfield, Windsor, Hughesdale, Blackburn North, Upwey, Airport West, Eltham North, Lynbrook, Montrose, Viewbank, Aspendale, Aspendale Gardens, Coburg North, Lysterfield, Mernda, Dallas, Collingwood, Beaconsfield, Heidelberg Heights, Tullamarine, Carlton North, Narre Warren North, Parkville, Darch, Ashwood, Kew East, Derrimut, Oakleigh East, Albert Park, Fairfield, Black Rock, Scoresby, Emerald, Clifton Hill, Docklands, Oak Park, Keilor, Bonbeach, Heidelberg, Frankston North, McKinnon, Westmeadows, Warrandyte, Campbellfield, Edithvale, Balaclava, Hadfield, Heidelberg West, Moorabbin, Albanvale, Chelsea Heights, Croydon Hills, Caulfield, Watsonia, Mont Albert North, Burnside Heights, Seabrook, Mont Albert, Abbotsford, Lyndhurst, Niddrie, Seddon, Warranwood, East Melbourne, Glen Huntly, Alphington, Croydon South, Hampton East, Burnside, Albion, The Basin, Yallambie, Laverton, Middle Park, Belgrave, Eaglemont, Pearcedale, Watsonia North, Wonga Park, Lower Plenty, Ivanhoe East, West Melbourne, Park Orchards, Aberfeldie, Carrum, Hurstbridge, Kingsville, Monbulk, Kingsbury, Coolaroo, Attwood, Upper Ferntree Gully, Kealba, Briar Hill, Sandhurst, Kilsyth South, North Warrandyte, Wandin North, Royal Park, St.Kilda West, Beaconsfield Upper, Ardeer, St Helena, Heatherton, Gowanbrae, Research, Yarra Glen, Keilor Park, Seville, Coldstream, Spotswood, Essendon North, Diggers Rest, Waterways, Notting Hill, Baxter, Plenty, Tecoma, Princes Hill, Wattle Glen, Jacana, Seaholme, Eumemmerring, Wattle Park, South Kingsville, Heathwood, Huntingdale, Officer, Keilor Lodge, Bellfield, Banyule, Travancore, Cranbourne South, Olinda, Belgrave South, Selby, Brooklyn, Werribee South, Devon Meadows, Cremorne, Kallista, Williamstown North, Ferny Creek, Yarrambat, Ripponlea, Essendon West, Belgrave Heights, Tooradin, Rockbank, Blind Bight, Caulfield East, Mount Dandenong, Silvan, Kalorama, Jolimont, Mickleham, Panton Hill, Junction Village, Sassafras, St Andrews, Langwarrin South, The Patch, Kangaroo Ground, One Tree Hill, Gardenvale, Strathmore Heights, Lysterfield South, Menzies Creek, Ravenhall, Macclesfield, Gruyere, Burwood Heights, Kooyong, Gisborne South, Bangholme, Harkaway, Clyde, Burnley, Avonsleigh, Mount Cottrell, Bulla, Warrandyte South, Cottles, Bridge, Robinson, Cannons Creek, Wildwood Wollert, Narre Warren East, Arthurs Creek, Wandin, East Hilbert, Plumpton, Smiths Gully, Yuroke, Guys Hill, Clematis, Dandenong South, Christmas Hills, Woodstock, Blackrock, Yan Yean, Oaklands Junction, Bend Of Islands, Sherbrooke, Kinkuna, Strathewen, Nutfield, Melbourne Airport, Dewhurst, Laverton North, Burnt Bridge, Keilor North, Tottenham, Somerton.